Lorraine Lang was one of a number of Thunder Bay curlers who was prevalent on the Canadian curling scene during the eighties. Certainly the jewel in Lorraine’s curling crown was acquired in 1989 when she and the Thunder Bay foursome skipped by Heather Houston captured the world women’s championship. Throughout her career, Lorraine played third with her first appearance at the Scott Tournament of Hearts in 1983. 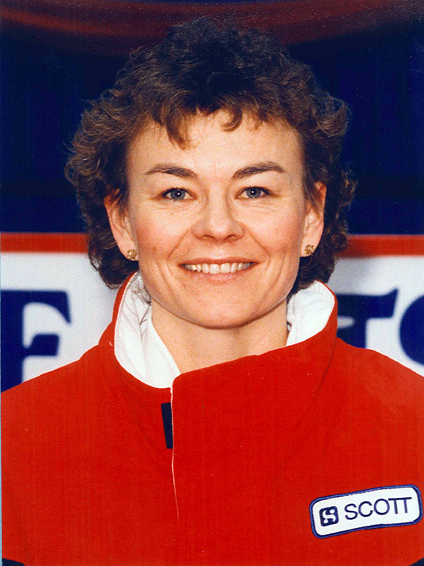 Lorraine returned with Heather Houston in 1988 and the team managed to take the Canadian crown only to face a disappointing loss at the world championship weeks later. The Houston team returned as Team Canada in 1989 and became the first and only team in the history of the Scott Tournament of Hearts to win the title as Team Canada. Lorraine also enjoyed success in mixed curling as lead on the team, skipped by husband Rick, that captured the Canadian title in 1981.